The electric utility business encompasses the process of generating electricity and sending power to the ultimate user. The electrical grid is the name given to the machinery and power lines that enable power to be sent from the power plant to the ultimate user of electricity. 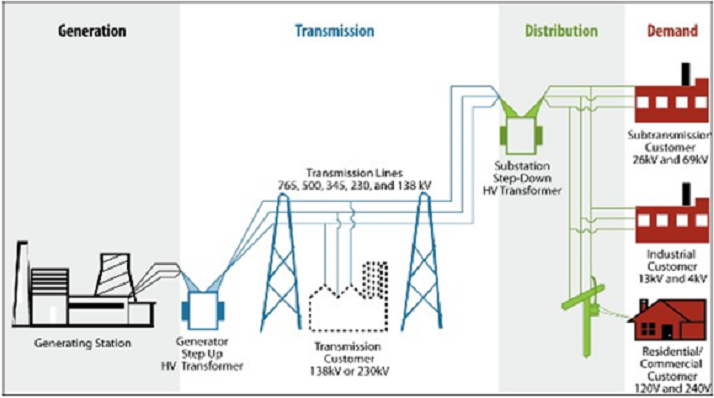 As seen in Figure 1, this generally requires an infrastructure made up of generating stations (where the power is produced), step-up transformers and transmission lines (whereby transformers increase the voltage so that the electricity can be sent over very long distances), and step-down transformers and distribution lines (whereby the voltage can be lowered allowing the electricity to be sent to businesses and homes to power machinery and devices). Depending on the regulatory regime in place, these system elements may be controlled by companies under state jurisdiction or entities under federal jurisdiction (such as regional transmission organizations or federal power marketing administrations). Source: Congressional Research Service, based on graphic found at https://reports.energy.gov/BlackoutFinal-Web.pdf (p. 5). Note: kV = kilovolts (or 1,000 volts). The grid relies on a number of electronic devices, switches and circuit breakers to regulate and report on the flow of electricity at different parts of the system. Together, these pieces of mechanical and automated equipment constitute the grid’s IC systems, managing power plant controls, transformer yard and power bus1 functions, transmission system, and distribution substations. 1 The bus bar is the point at which electrical power from the power plant is connected to transmission system. One IC system used to control remote operations of the power grid is the Supervisory Control and Data Acquisition (SCADA) system. Over time, modification of SCADA systems has resulted in connection of many of these older, legacy systems to the Internet. However, many of these legacy SCADA systems were not designed with security features, allowing other potential pathways for a cyberattack. As a result, these systems may be vulnerable to intrusion through data reporting pathways, or attacks (for example) using a thumb drive to download malware. However, some of these earlier designs and configurations may not be as vulnerable to an Internet-launched cyberattack. The security issue, for old and new systems, then becomes both how they are connected to the utility’s other systems, and what levels of security exist to detect and deter potential intrusions. Source: See Guide to Industrial Control Systems Security at http://csrc.nist.gov/publications/nistpubs/800-82/SP800-82-final.pdf. Notes: WAN = Wide Area Network; MTU = Master Terminal Unit (server for SCADA system); IED = Intelligent Electronic Device; RTU = Remote Terminal Unit. 4 See Keith Stouffer, Joe Falco, and Karen Scarfone, Guide to Industrial Control Systems (ICS) Security, National Institute of Standards and Technology, NIST Special Publication 800-82, June 2011, http://csrc.nist.gov/publications/nistpubs/800-82/SP800-82-final.pdf. (Hereinafter NISTICS). 5 “RTUs are field devices often equipped with wireless radio interfaces to support remote situations where wire-based communications are unavailable.” NISTICS. 6 Stew Magnuson, “Power Companies Struggle to Maintain Defenses Against Cyberattack,” National Defense Magazine, March 2014, http://www.nationaldefensemagazine.org/archive/2014/March/Pages/ PowerCompaniesStruggletoMaintainDefensesAgainstCyberattacks.aspx. As the Smart Grid becomes a ubiquitous reality, Cyber Force is here to fix your security problems for today real world. Source: Consumer Energy Report. See http://www.consumerenergyreport.com/wp-content/uploads/2010/04/ smartgrid.jpg. 7 Department of Energy, Enhancing the Smart Grid: Integrating Clean Distributed and Renewable Generation, 2009, http://energy.gov/sites/prod/files/oeprod/DocumentsandMedia/RDSI_fact_sheet-090209.pdf.